With the ability to look stunning in any attire and capable of pulling off a bikini and a sari with equal grace, Deepika has a figure to die for. Perhaps Bollywood’s biggest foodie, Deepika’s dazzling beauty, and flawless body are the results of her hard work, strict diet regime and a disciplined life. Even before making her mark in Bollywood, Deepika had set fitness mantras for herself. Known for her beautiful legs, dusky beauty, and a curvaceous figure, Deepika has taken Bollywood by storm. Deepika has always worked on her diet and fitness to stay in the ravishing shape she is today and has been successful in keeping flab away. ­We did a little digging and found out about her daily nutrition and workout routine. Here’s what we got to know. Blessed with a good metabolism, Deepika makes sure to eat healthily and has 6 meals in a day. She tries to eat every 2 hours – coconut water, fruits, or nuts. Her diet is rich in fiber, omega-3 fatty acids, complex carbs, vitamins, and minerals. She also likes to keep herself hydrated throughout her day no matter how busy her schedule is. Deepika starts her day with a glass of lukewarm water with honey and juice of a lime or fenugreek seeds soaked overnight.Breakfast usually consists of a glass of low-fat milk with 2 egg-whites or 2 idlis, 2 plain dosas, 2 servings of upma or quinoa. Throughout her day, Deepika likes to munch on nuts. She also has a pre-lunch snack which mostly consists of a bowl of fresh fruits. 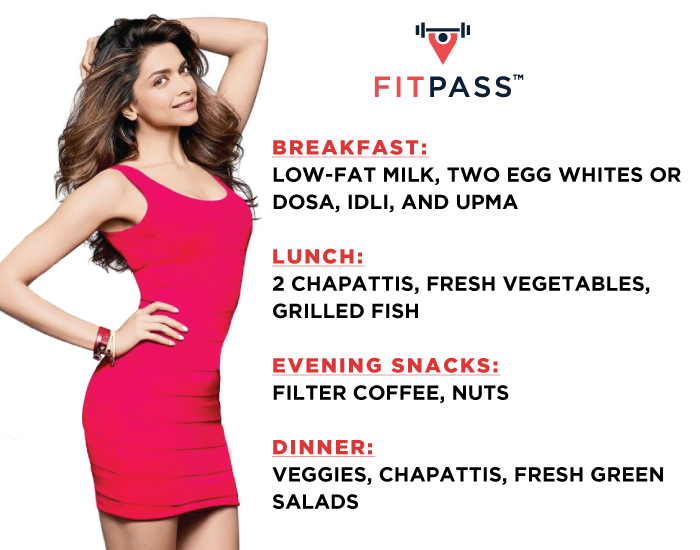 Lunch for Deepika is a protein-rich diet. She usually eats grilled fish or chicken with vegetables or chapati. In the evening, she likes to indulge in filter coffee with nuts, mostly almonds or pecans. Her dinner is usually light where she eats salad, vegetables with chapati or dal. To satisfy her sweet cravings, she occasionally eats a piece of dark chocolate. Daughter of former Indian badminton player, Prakash Padukone – Deepika has always led an active lifestyle by playing badminton from a young age. As a state-level badminton player, she now likes to mix her workout routines and make them fun with Pilates, Yoga, Dance, and Weight training. She does a lot of freehand weights and 4-5 sets of stretching exercises with 10-12 reps in between her Pilates or stretching routines. Deepika likes to start her day by practicing Yoga which helps improve her concentration and strength and keeps her mind active throughout the day. Her effortless dance moves on-screen is the result of her Dance training. She trains in different dance forms, like Jazz, Kathak, Bharatanatyam, and Bollywood. While traveling or busy with her shootings, she makes sure to at least indulge in a brisk walk in the morning and evening. However, Deepika loves to do Pilates as she believes it has refined her workout regime. Her strong core, increased flexibility, and her improved posture have all been possible because of practicing Pilates and stretching exercises. Her Pilates workouts consist of using machines and props, such as resistance bands, wunda chair, foam weights and much more to complete her workouts. Ruling Bollywood for over a decade now, it’s not an easy task to maintain those lean, long legs and washboard abs. Disciplined early on in her life, Deepika thoroughly enjoys working out. She executes each workout to perfection and enjoys them too! Having confessed in several interviews of being a foodie and having not one, but many sweet teeth’s, Deepika has been able to moderate her food cravings and make healthy eating choices. Here’s wishing her more success and health on the release of Padmavati!